If you hadn’t noticed the new state tally, I finally added our smallest state – Rhode Island – to my collection this past weekend. Breeah and I spent one full day in Block Island and parts of two others in Newport and Providence as we showed some love to the last state both of us needed in the Eastern Time Zone. But I’ll save that for my next writeup (I’m saving a lot lately, aren’t I? – my backlog is getting ridiculous). 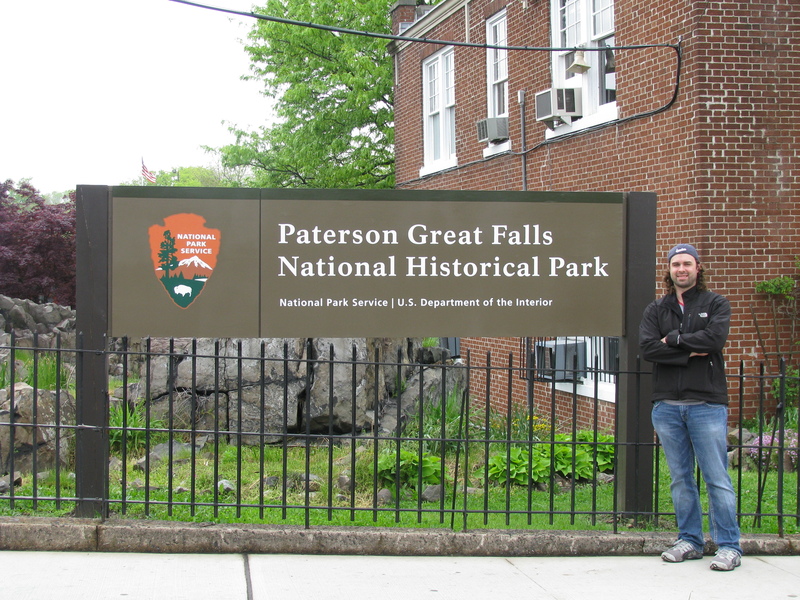 First I want to touch on a National Park visit that I brought up a few months back, the Paterson Great Falls National Historical Park in Paterson, N.J.
A gloomy (and toll-ridden) drive through the New Jersey Turnpike and the Garden State Parkway got us all the way to Paterson in a snap so we could take in America’s 397th National Park (getting to be quite a lot!). The park was signed into law on March 30, 2009 but wasn’t until last November that the Park was officially dedicated. I’m a big fan of waterfalls – so the fact that something like this existed just a stones throw from NYC fascinated me. 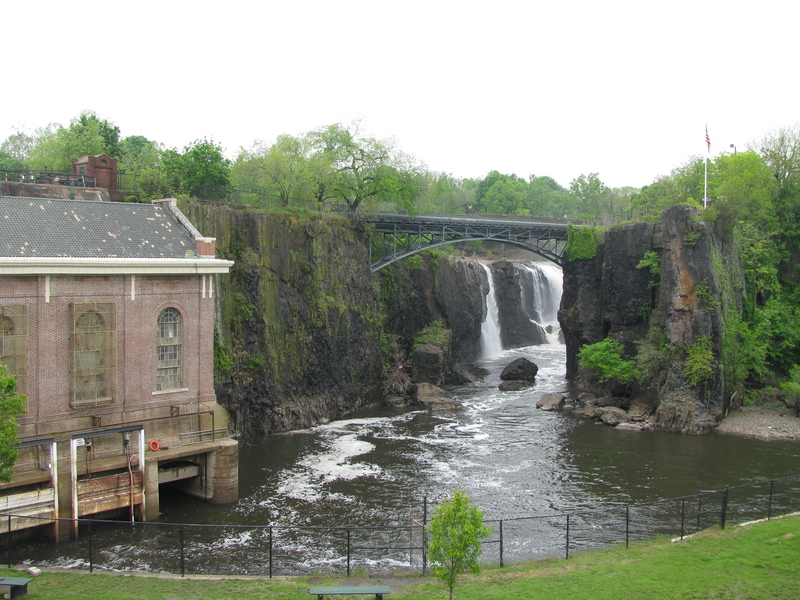 It’s amazing how such a neat natural landmark is just hiding away in the unassuming New York exurb of Paterson. 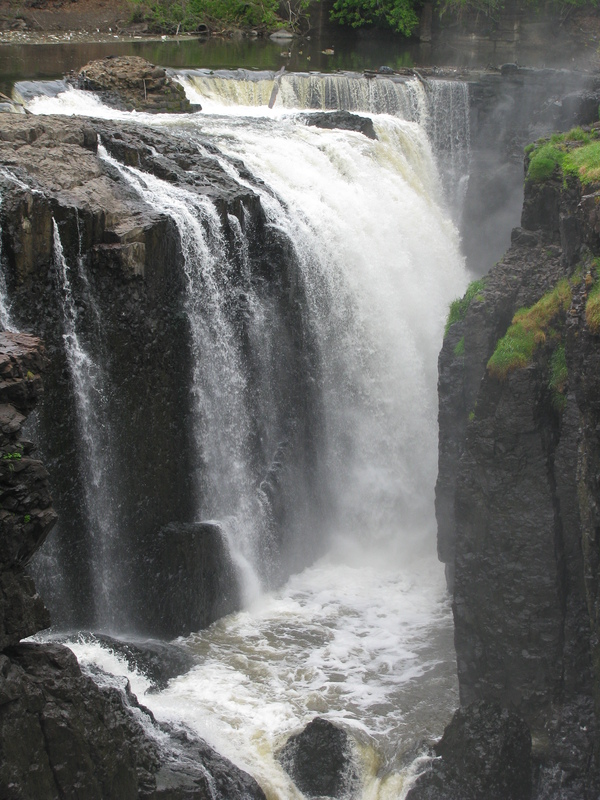 The importance of the falls dates back to the 18th century and Alexander Hamilton – who saw the falls as an opportunity for water-based energies and industrialism. In fact, a statue of Hamilton exists on site, overlooking the Falls and the mill (which still actively supplies electricity to the surrounding area). The park isn’t very large – a quick walk through the area will take you over a bridge and then to another lookout near the falls. This area of Paterson is a bit worn in – like a lot of urban Jersey – and graffiti makes its mark all over the park. Somehow that doesn’t take away from the general appeal, though, perhaps making one appreciate all the more unique a location for such a landmark. There will be a test on this later! I’d say to give yourself a good 15-20 minutes to take the walk and get a few good photos – but if you have any plans of stopping in the visitor center…well, be warned! Our 20-minute visit turned into nearly and hour and a half after we met the friendly (and very chatty) guide at the office. I didn’t get his name, but learned many things about local Paterson (and NYC) streetball culture in the 60s and 70s, how hot dogs were invented just down the road (the hot dog Wikipedia article does cite the first “hot dog” reference as coming from Paterson) and other things about local art work, Larry Doby and what not… (Didn’t really get any more intel on the Falls – but I don’t think he was an official park ranger). 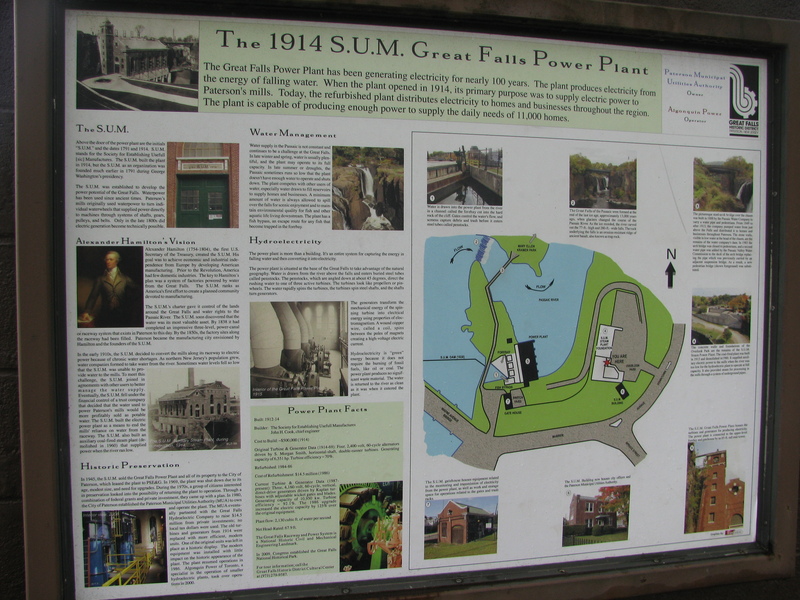 We stopped in just to stamp our park passport there and be on our way, but as it stands now I could teach a history class on the city of Paterson! (No joke – he was a very friendly and welcoming dude). 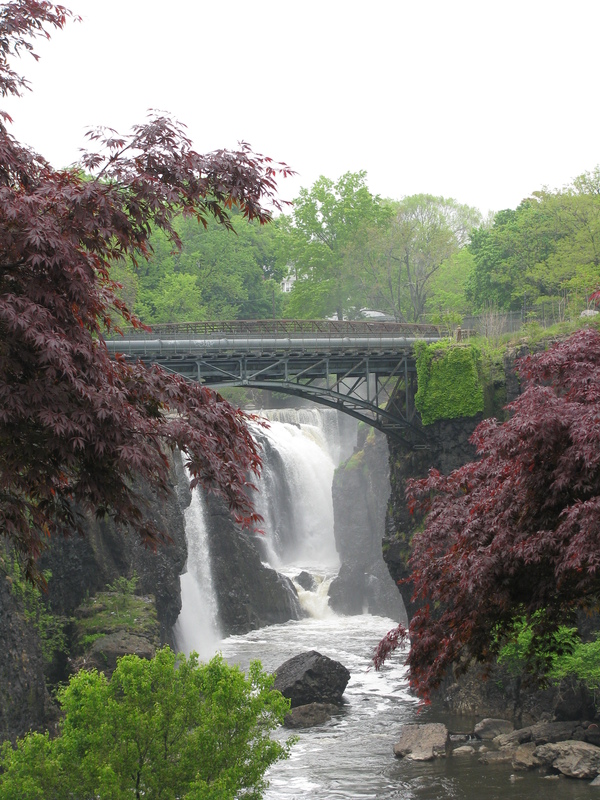 The Paterson Great Falls is a fairly easy visit, if you don’t mind tolling through New Jersey (which is usually not my thing). If we had more time, we might have visited Morristown as well – but I was certainly satisfied with our stopover.